Oh my Goodness...Heaven "scent"! The smell alone is worth baking these. The best part...this dough starts you off in the morning with with SUNDAY MORNING CINNAMON ROLLS and follows you through the night with BUTTERED ROSEMARY BUNS! Now that I have devoured sampled numerous cinnamon rolls and rosemary buns in the last 12 hours I am starting to think my New Years Cooking Resolution may have not been such a good idea... OK, but really you can space these out over a couple days. 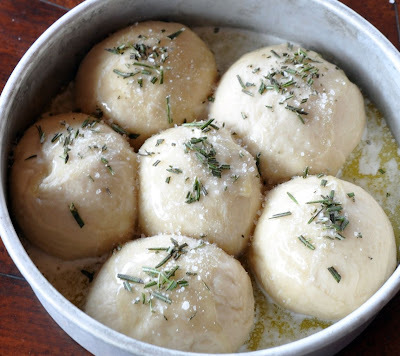 You can make the dough, roll dough balls and put in a greased pan, cover with a towel and keep in the fridge for a night or two. When you take them out they will need to rise for about 3 hours and then will be ready to bake. NOTE: This dough is the same as SUNDAY MORNING CINNAMON ROLLS dough. 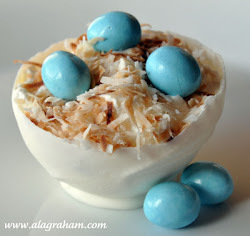 Click link for pictorial. Suggestion: if you make this amount of dough split it between cinnamon rolls (would make 15 rolls) and buns (would make 15+ buns) unless you want approx 3 dozen buns! After rising for at least an hour, add 1 more cup of flour, the baking powder, baking soda and salt. Stir mixture together. 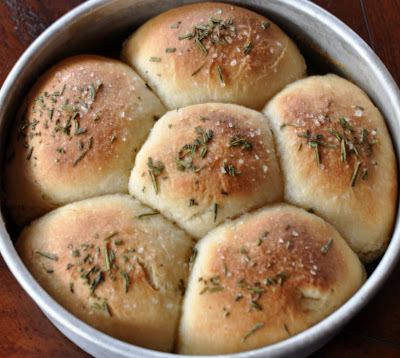 (At this point, you could cover the dough and put it in the fridge until you need it or roll out the dough balls for the buns. Grease round pan. 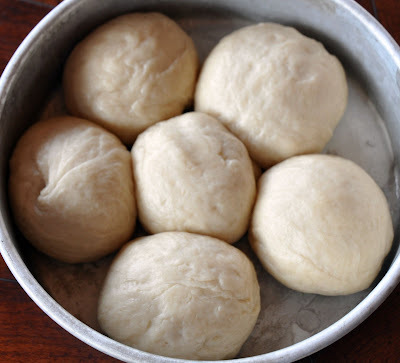 Roll the dough into balls and place in pan leaving plenty of room for rising. Cover and allow to rise for several hours. After rising, brush rolls with melted butter. Sprinkle on chopped rosemary. Sprinkle with coarse sea salt. Now I know this looks like a lot of butter but trust me you need it! Bake at 400 degrees for 15-20 minutes, until buns are a deep golden brown. I just found your Facebook Blog Page, and then I spotted these. Did you know that I also made these, in a cast iron skillet? My recipe is similar to yours-- I used some whole wheat flour. 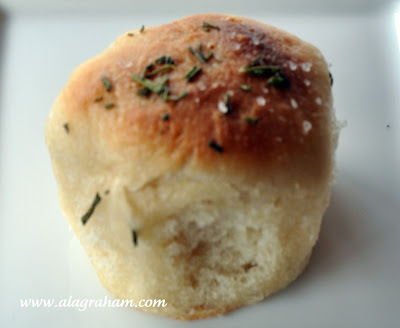 These are my husbands #1 absolutely favorite roll that I make. He is so happy with the sea salt and rosemary combo. I might surprise him with these on Valentine's Day. PW used frozen bread dough if I remember correctly. It's nice to see a dough I can make myself. Just read about you in the Argus. The ingredients call for one package of dry yeast, but the instructions use the word "both." Is it one package or two? Opera Mini has more than sitey.me million customers across Go Here the globe, as well as Best Opera Mini APK Android Download Free & Direct it is the third-largest application Opera Mini in India with over million individuals phrases Opera Browser and also expressions from Google directly by typing.